In 1791, the first Secretary of the Treasury of the US, Alexander Hamilton, convinced then-new president George Washington to create a central bank for the country. Secretary of State Thomas Jefferson opposed the idea, as he felt that it would lead to speculation, financial manipulation, and corruption. He was correct, and in 1811, its charter was not renewed by Congress. Then, the US got itself into economic trouble over the War of 1812 and needed money. In 1816, a Second Bank of the United States was created. Andrew Jackson took the same view as Mister Jefferson before him and, in 1836, succeeded in getting the bank dissolved. Then, in 1913, the leading bankers of the US succeeded in pushing through a third central bank, the Federal Reserve. At that time, critics echoed the sentiments of Messrs. Jefferson and Jackson, but their warnings were not heeded. For over 100 years, the US has been saddled by a central bank, which has been manifestly guilty of speculation, financial manipulation, and corruption, just as predicted by Mister Jefferson. From its inception, one of the goals of the bank was to create inflation. And, here, it’s important to emphasise the term “goals.” Inflation was not an accidental by-product of the Fed - it was a goal. Over the last century, the Fed has often stated that inflation is both normal and necessary. And yet, historically, it has often been the case that an individual could go through his entire lifetime without inflation, without detriment to his economic life. Yet, whenever the American people suffer as a result of inflation, the Fed is quick to advise them that, without it, the country could not function correctly. If the reader is of an age that he can remember the inventions of Rube Goldberg, who designed absurdly complicated machinery that accomplished little or nothing, he might see the resemblance of a Rube Goldberg design in the above illustration. Well, what’s missing is the Fed itself. As stated above, back in 1913, one of the goals in the creation of the Fed was to have an entity that had the power to create currency, which would mean the power to create inflation. It’s a given that all governments tax their people. Governments are, by their very nature, parasitical entities that produce nothing but live off the production of others. And, so, it can be expected that any government will increase taxes as much and as often as it can get away with it. The problem is that, at some point, those being taxed rebel, and the government is either overthrown or the tax must be diminished. This dynamic has existed for thousands of years. However, inflation is a bit of a magic trick. Now, remember, a magician does no magic. What he does is create an illusion, often through the employment of a distraction, which fools the audience into failing to understand what he’s really doing. 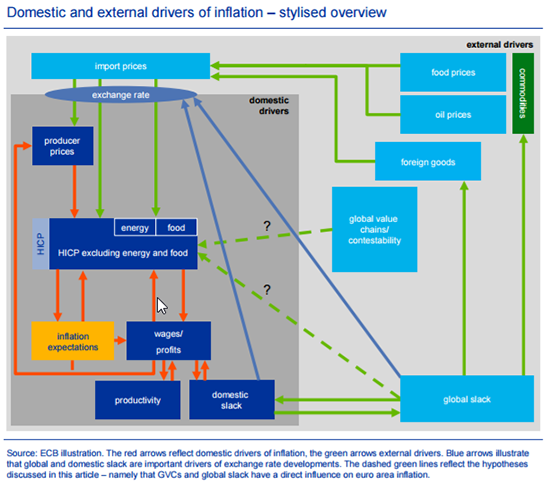 And, for a central bank, inflation is the ideal magic trick. The public do not see inflation as a tax; the magician has presented it as a normal and even necessary condition of a healthy economy. However, what inflation (which has traditionally been defined as the increase in the amount of currency in circulation) really accomplishes is to devalue the currency through oversupply. And, of course, anyone who keeps his wealth (however large or small) in currency units loses a portion of it with each devaluation. In the 100-plus years since the creation of the Federal Reserve, the Fed has steadily inflated the US dollar. Over time, this has resulted in the dollar being devalued by over 97%. The dollar is now virtually played out in value and is due for disposal. In order to continue to “tax” the American people through inflation, a reset is needed, with a new currency, which can then also be steadily devalued through inflation. Once the above process is understood, it’s understandable if the individual feels that his government, along with the Fed, has been robbing him all his life. He’s right—it has. And it’s done so without ever needing to point a gun to his head. The magic trick has been an eminently successful one, and there’s no reason to assume that the average person will ever unmask and denounce the magician. However, the individual who understands the trick can choose to mitigate his losses. He can take measures to remove his wealth from any country that steadily imposes inflation upon him and store it in a country where this either does not occur, or occurs to a lesser degree. Moving a portion of your wealth overseas sounds daunting... like something only the ultra-rich can or even should do. In reality, it’s one of the most important steps anyone can take to protect his wealth from an out of control government. Now Doug Casey is sharing practical ways to get started in his timely special report Getting Out of Dodge. Click here to download your free PDF copy now.